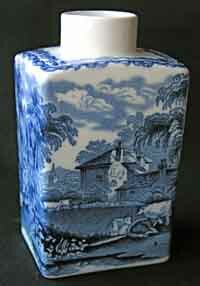 A popular BLUE AND WHITE transfer pattern. According to Bill Parkin, in his booklet, ‘The Earthenwares of Booths 1864-1948’, this was produced using old engravings from the famous Davenport company, ironstone manufacturers of the C19th. 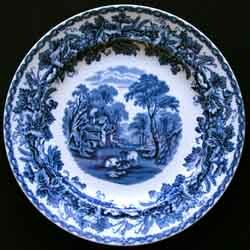 A8024 is the pattern number found on post-war items. These later items dispense with the attractive narrow border of intertwined leaves found on earlier examples of the pattern (see right).